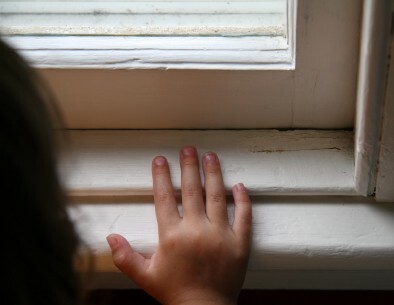 Touching a window sill with old peeling lead paint. Lead paint is the main hazard a painter can encounter. If your home was built before 1978, there’s a good chance that the original paint or primer is lead-based. Testing the paint, especially if it is chipped or peeling, is highly recommended. It will protect you and your family from potentially serious health problems. Lead poisoning can cause abdominal pain, anemia, muscle weakness, reproductive problems and cataracts. It can also cause severe or fatal damage to kidneys and the nervous system. Children and unborn fetuses, are especially vulnerable because of their smaller body mass and rapid neurological development. Untreated, lead poisoning can contribute to mental retardation and undeveloped motor skills. can be done by a certified inspector or risk assessor. For more information about what these titles mean, contact the National Lead Information Center at 1-800-424-LEAD or visit www.epa.gov/lead. The information centre is under the auspices of the federal government’s Environmental Protection Agency (EPA). Volatile organic compounds (VOCs) are also found in most older paints. The good news is that the same precautions that prevent lead poisoning can also shield you from most of the effects of VOCs. The EPA’s website provides guidelines for safe home renovation. Here are some of the main tips found there. Work areas may need to be blocked off with plastic to contain dust. You may need alternative bedroom, bathroom and kitchen arrangements. Also think of safe places for pets. Avoid renovation methods that generate large amounts of contaminated dust. Contractors are prohibited from doing a few things, because they stir up so much contamination. They cannot: Use an open flame to burn or torch the paint. They also can’t sand, grind, plane, needle-gun or blast without using a shroud and a attachment. Heat guns cannot be hotter than 1100 degrees Fahrenheit. If you hire a contractor make sure they are EPA certified. Remember: Lead paint is not to be taken lightly. Ignoring the problem or using improper removal techniques can create severe and lasting health problems for you and your family. Please be safe and take proper precautions when dealing with lead paint.